Dental implants consist of three key parts. They include the titanium post itself, the abutment screw that connects the implant and restoration, and of course the restoration that becomes part of your new smile. However, thanks to innovations in dental implant technology, your dentist offers multiple types of implants for patients. All implants are customized to fit patients exactly, ensuring they last for decades without issue. For this reason, your dentist wanted to highlight the different types of dental implants in Fort Worth and to help determine which one might be best for you! According to the American Academy of Implant Dentistry, there are two main types of dental implants: endosteal and subperiosteal. Let’s define them. Endosteal – These are the most common implant used in dentistry. They are placed directly into the jawbone and designed to integrate with it. They are shaped like small screws and typically made of titanium, but zirconia can also be used if patients exhibit an allergic reaction. Subperiosteal – While these implants are meant to go underneath the gums, they do not integrate with the jawbone. Instead, they simply rest on top. These implants are ideal for patients who either do not have enough bone for integration, or who don’t want to undergo additional treatment to rebuild the jawbone. If your dentist determines you have enough bone to receive an implant, the endosteal option is definitely the ideal choice. 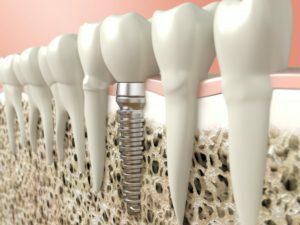 Osseointegration is partly why dental implants are so sturdy, often more so than natural teeth since they lack a periodontal ligament. This ligament usually separates the tooth and bone apart, which isn’t the case for an endosteal implant. Of course, many older patients may not have addressed tooth loss as soon as others, causing their bone to shrink. Subperiosteal implants are ideal considering many patients were turned away for implants in the past. Now they can replace teeth and achieve many of the same functions they’d get with endosteal, without needing as much bone. Are Implant-Retained Dentures Right for You? While we’re on the subject of types of implants, it’s worth noting that patients can also replace an entire arch of teeth through implant-retained dentures. Not only is this a sturdier solution to dentures in general, but it offers the same benefits you’d find with single implants. Unlike traditional dentures, these are worn permanently, making your oral care indistinguishable from caring for natural teeth. You’ll also be able to eat all your favorite foods without worry of your denture sliding or falling out in the process. Ready to get started learning about the treatment for dental implants in Fort Worth? Schedule a consultation with your dentist to get started! For 25 years, Dr. John G. Boyd has been providing patients the most comprehensive and exceptional dental care possible. To stay ahead of the latest techniques and technologies in dentistry, he became a graduate and teaching advisor at the L.D. Pankey Institute, one of the most renown schools for continuing education in dentistry. To learn more about your implant dentist in Fort Worth, contact him through his website.